Photograph of the view from the south of the Adishvara Bhagarai temple in the Vimalavasi Tuk, Satrunjaya. 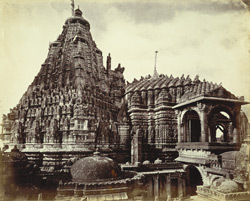 Lyon wrote: "In this view the Shikara or Spire of the great temple of Adishwar is represented in its entirety, while adjoining it is the upper portion of the Mandap or Porch. The details are perhaps somewhat minute, but it will be observed that the same sinuosity, which has been so often met with before in the South has here again been adopted and the side of the building, which had it been flat would have been plain, is at once rendered pleasing from the effect of light and shade thus given.